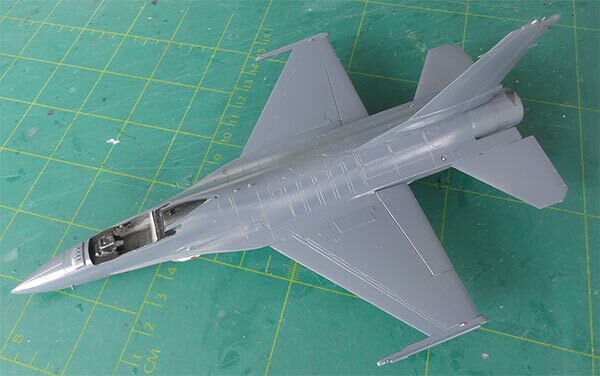 Another release of the 1985 Hasegawa issued F-16A has been released as a F-16A ADF with some additional parts. 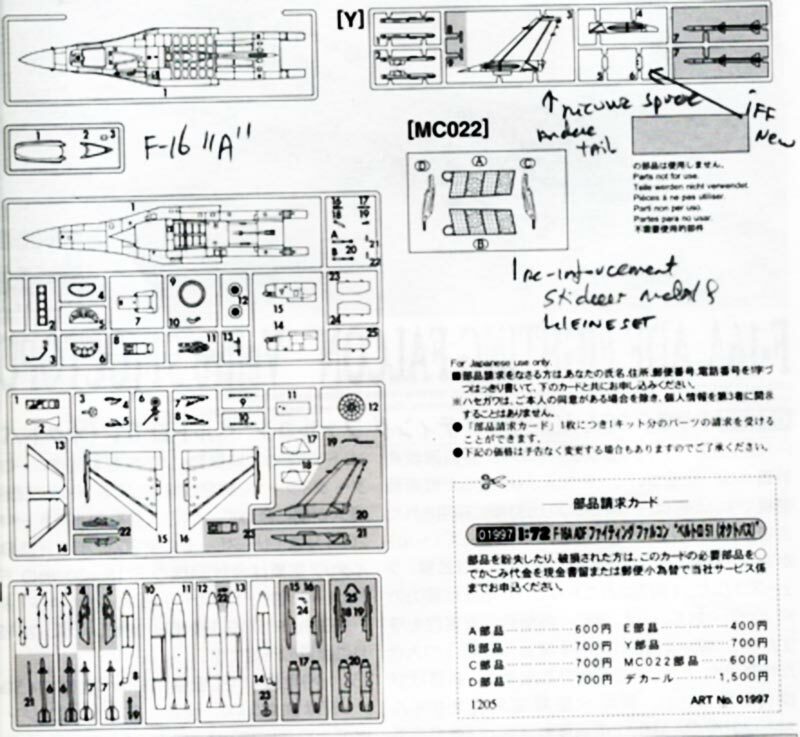 The kit has many common sprues as the older releases such as "F-16A Plus #601" discussed on page 5. The F-16A ADF is for the "Advanced Defense Fighter" which was a "stop gap" as NATO member Italy required air defense fighters. This was caused by delays in the Eurofighter program. As a temporary solution first Italy leased from the United Kingdom from 1993 some 10 Tornado F3 fighters. 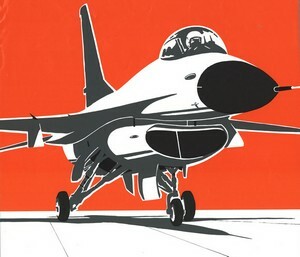 Still after a decade the Eurofighter Typhoons were not really delivered and to save money they decided to turn to Lockheed Martin to lease from 2003 F-16 ADF aircraft. The "Peace Ceasar" program was started to supply refurbish and lease ex- USAF F-16 Block 15 ADF aircraft that were mostly in storage at Davis Monthan USA. The aircraft were refurbished with new structural components and updated new avionics. From Summer 2003 to 2004 some 30 of these F-16A ADF Block 15 aircraft arrived in addition to some 4 F-16B trainers in Italy. They were operated until May 2012 by the "Aeronautica Militare Italiana" (AMI). 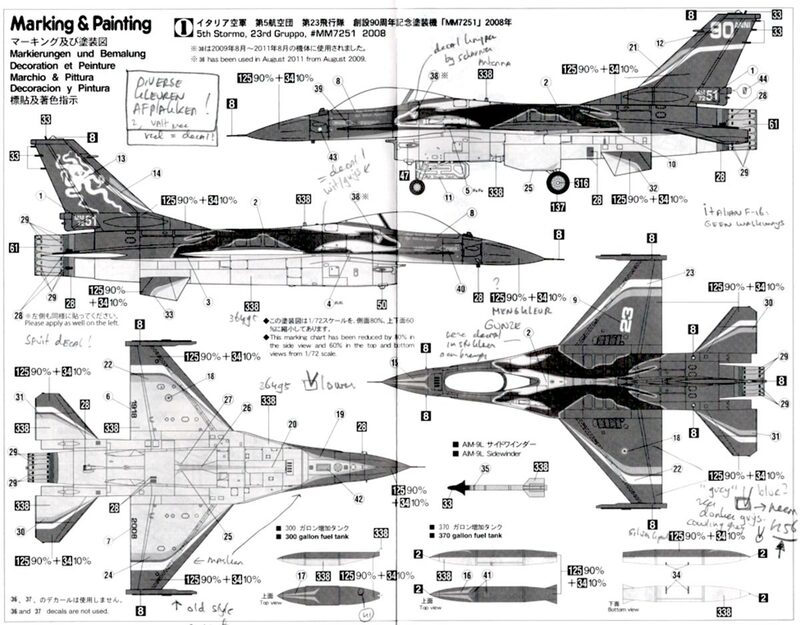 The Hasegawa F-16A ADF kit #01997 has 4 plastic sprues and 1 clear sprue of the original F-16A kit but also 1 additional sprue with another vertical tail, some new AMRAAM capable missile launchers and 2 parts for the advanced IFF antennas below the intake and in front of the canopy. Some of the older parts are not used. Total parts to be used is about 60. The ADF has a spot light aft of the radar nose on the left side and also a self adhesive set of stiffener plates is also supplied. 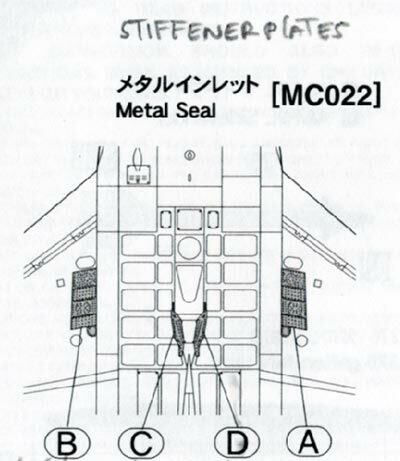 These are the bolted on stiffener plates often also seen on upgrades older MLU aircraft. The standard small intake is in the kit along with the exhaust is for the Pratt and Whitney F100. 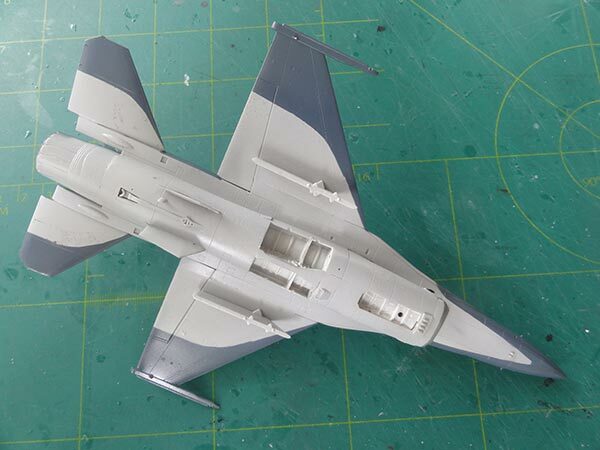 The standard horizontal stabilizers are in the kit as well as the normal main wheels and flat main gear doors. Also different types of IFF antennas are included. 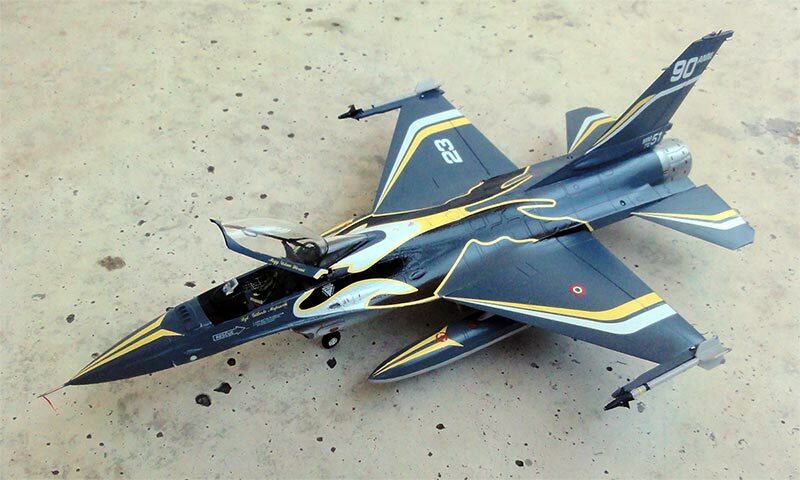 The package is complete and comes also with a very attractive decalsheet for the F-16A ADF scheme of the "Veltro 51" meaning Octopus in Italian. 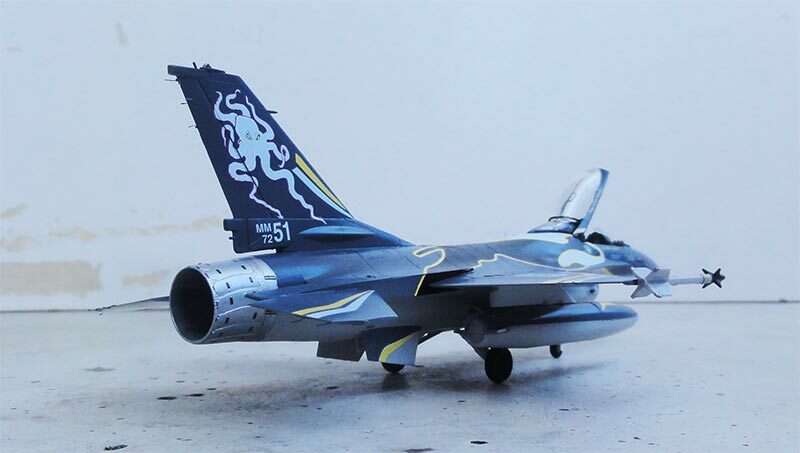 This was a specially painted aircraft of the AMI 5th Stormo/ 23 Gruppo in 2008. You get the central drawing on the spine and tail, the other areas should be airbrushed but the yellow cheat lines are supplied. (sorry, I forgot to photograph the decal sheet). 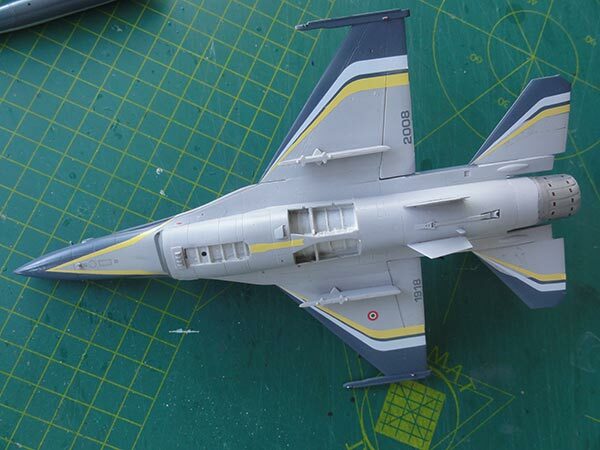 This can be done almost as per kit but I did a few improvements very similar as to the previous made Hasegawa F-16A models. In the kit the intake is a bit undeep so the rear section of part #B4 was cut off with a razor saw to get a deepened look. The cockpit is very simplistic but the throtlle and control stick are there. The one piece ACES II seat #B8 is very simple and can be replaced by after market ones or detail it yourself. 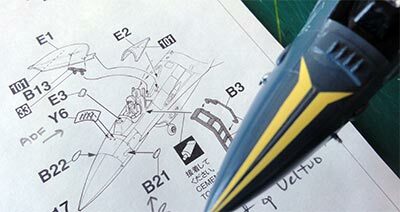 As with all Hasegawa kits the wing halves installment needs care to ensure a correct dihedral. Putty and filler is needed. Also, the rear engine section needs quite some sanding to get flush surfaces. 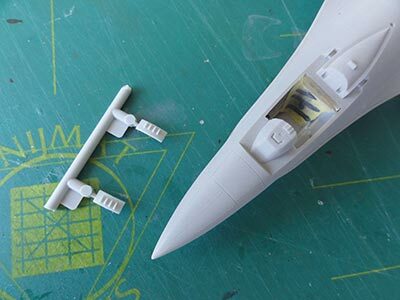 The model main parts were now joined. After that a coat of base grey was airbrushed to look for any imperfections. Any gaps and ridges were filled and sanded. (the smaller parts thus not yet fitted). 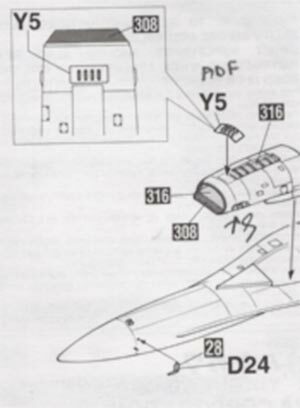 On the vertical tail the lower rear fairing is the standard USAF type without a parachute pack but for the ADF there is a small fairing amidst the base. This is nicely provided on the 2 tail halves. The ADF also has the (typical also seen on upgraded MLU) stiffener plates. These are nicely provided as self adhesive metallic plates in the kit. Stick these to the upper fuselage. The 2 groups of IFF antennas ("bird slicers" on top) and lower intake area were now added , parts #Y5 and #Y6. These are on a raised panel and thus not flush with older F-16 Blocks. (this can also be done earlier but I wanted to make sure the assemblies were smooth without gaps). The "Veltro" carried the under wing 370 tanks and central tank so assemble these. The other pylons seen in kit STEP 11 #Y2 were not installed. 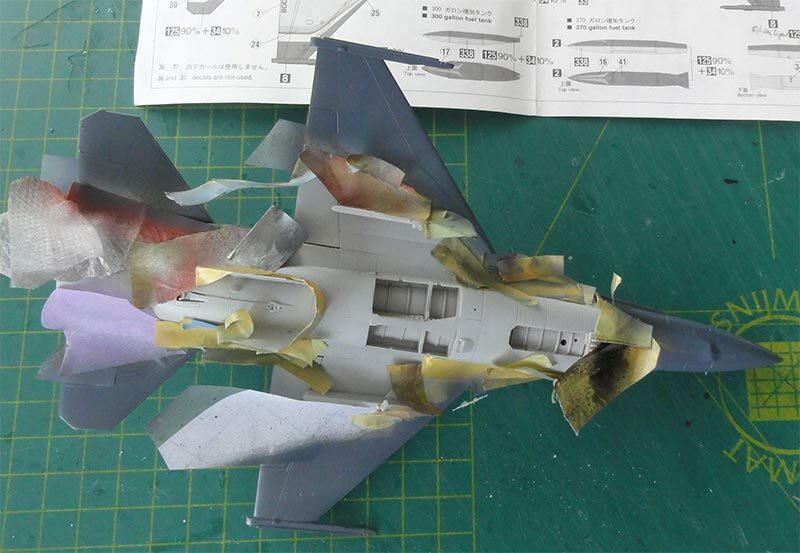 The standard ventral fins #C17 and #C18 below the fuselage need a bit white glue to close the tiny gaps. The special colour scheme could now be applied. The lower surfaces of the "Veltro" special scheme colour is FS36495 for which I used Gunze Sangyo H338. The darker blue colour is indicated by Hasegawa as 90% Gunze H125 + 10% Gunze H34. I simply settled for Gunze Sangyo H56 "intermediate blue" which I think looks good. 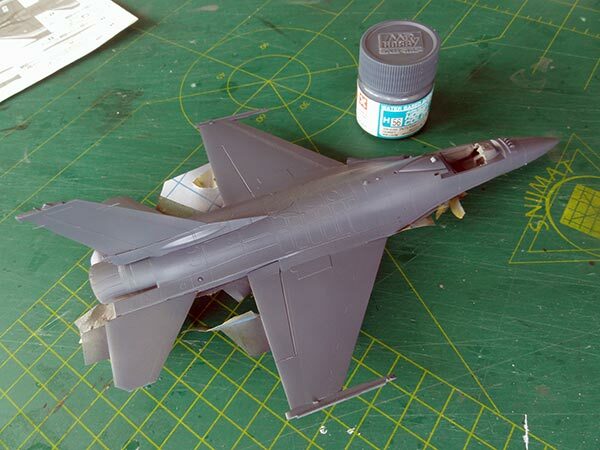 Before airbrushing this colour, masking is needed on some areas at the lower surfaces. 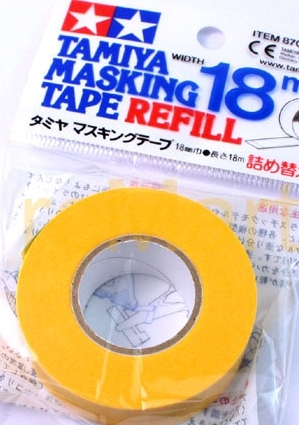 I made a paper copy of the decal sheet and used it as pattern to cut masks from low tack Tamiya masking tape. The result is seen here after H56 was also airbrushed. 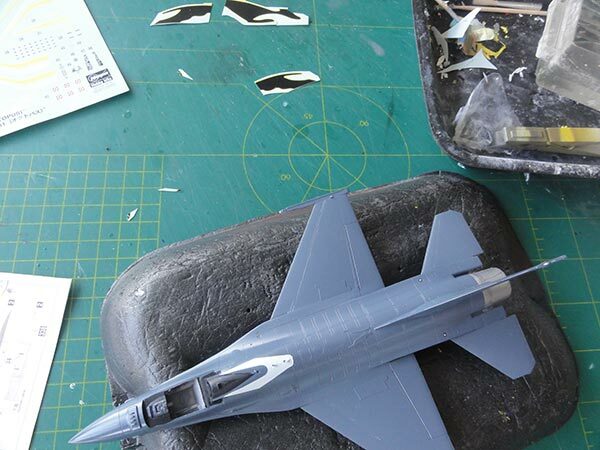 The stiffener plates can be seen on the fuselage spine and inboard wing. 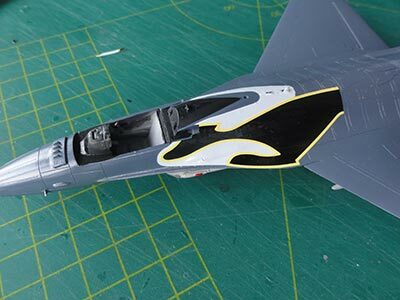 The next step was to apply the decals. The surfaces already have a gloss sheen so it can be done. The decals are fine. 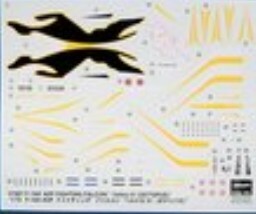 I cut the upper large Hound Dog decal "2" in several sections in order to fit them easier. I also used some decal softener fluid, here DACO. The yellow cheatlines need care to apply as well. A little bit of painting slight edges with paint was only required such as on the ventral fins. The overall look was great. Note that this "Veltro" scheme has no walkway lines and not a lot of smaller stencilling. 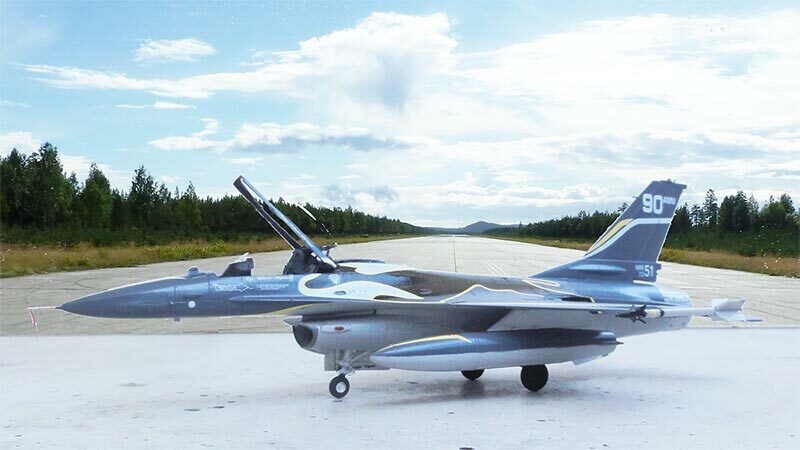 The nose landing gear is one piece with an integrally moulded nose wheel. Some painting and wash may improve how it looks. For the rest, assembly is straight forward such as the main gear with white bays and gear legs. Inside the main gear bay I added the missing battery pack and some hydraulics from thin metal wire. In the medium grey painted cockpit tub the instrument consoles were painted with black instruments. 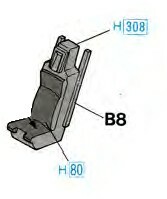 The HUD was set in place and on the seat #B8 added details were harnesses. 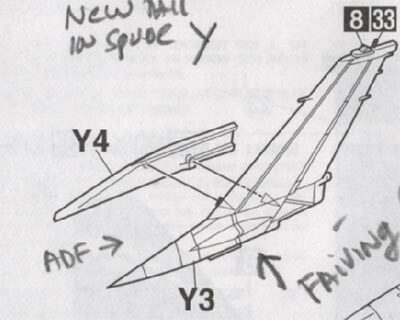 The 2x3 wing + 2x3 stabilizer + 1x3 tail = 15 static dischargers were added made from thin fishing wire and painted black. The nose pitot was replaced by one made from a needle. At the right side the second pitot #D24 was fitted aft of the radar nose. 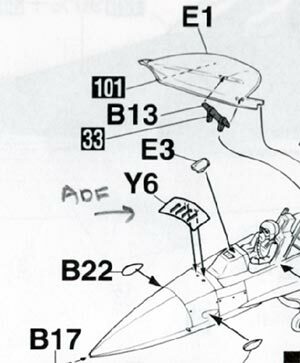 (In earlier kit releases this pitot was forgotten by Hasegawa). The overall model got a varnish coat airbrushed on Johnson Clear/Pledge with one drop of Glycerine to improve flowing. The canopy colour of the Veltro is unclear for me. As it is an old block aircraft, I assumed it had a untinted colour. So the kit canopy was used. Inside the canopy I added the missing pair of handles seen inside all F-16 canopies and finally the canopy set in place. 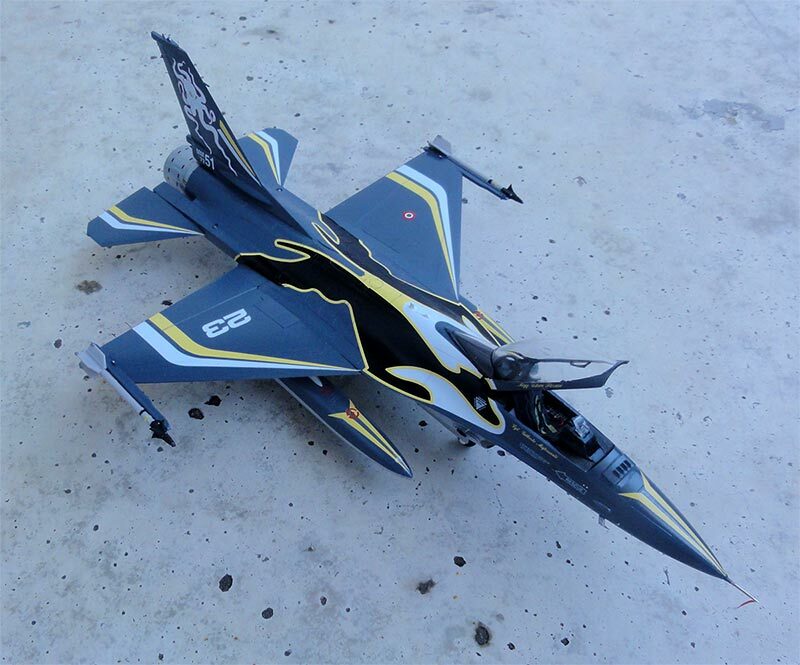 That completed this very nice AMI F-16A ADF block 15 "Veltro 51" ! 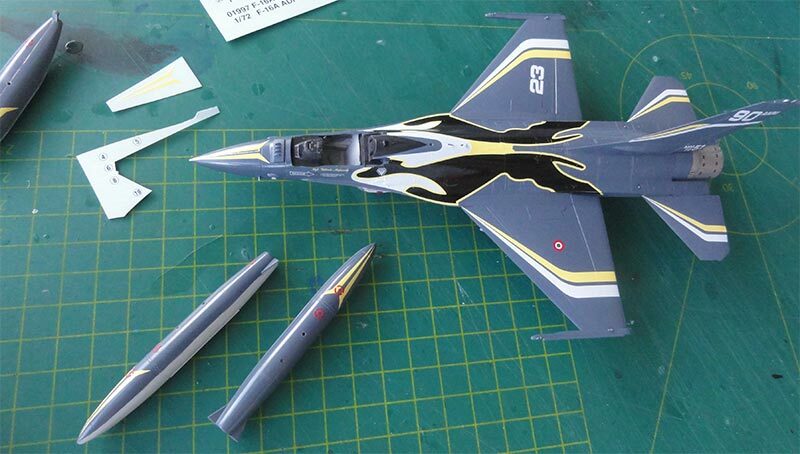 The 21th completed kit in the 1/72 F-16 series. Military aviation in the Kingdom of Italy started with balloons in about 1884. In 1911 the first aircraft were used during the Italo-Turkish war. Some aircraft were used for reconnaissance and even bombing. The Regia Aeronautica was established March 1923. Leader Mussolini used its force in Ethiopia in 1935 and in the Spanish civil war between 1936 and 1939. Important Italian aircraft manufacturers were Fiat and Savio Marchetti. June 1940 Italy was one of the Axis powers to fight in the Second World War. After the war ended Italy became a Republic and in June 1946 the rebirthed Aeronautica Militare (AM) was a fact. Some Ambrosini, Macchi and CANT aircraft were still used. The American MDAP program saw delivery of P-51's and P-47's and many other types like the Beech C-45. 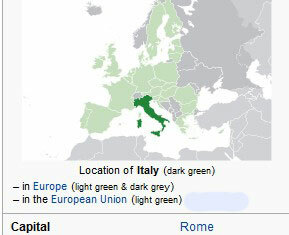 Italy joined NATO in 1949 and soon there was a Cold War. Over 150 Spitfires were acquired from Great Britain, followed in 1950 by some 250 Vampire jets. Fiat developed trainers and in the early 1950s the first jets arrived such as over 250 F-84G Thunderjet, some 200 F-84F Thunderstreak and some 100 F-86 Sabres that were common aircraft of NATO air forces. Transports were types like the C-119 and C-47. The Italian manufacturers also developed jets like the Fiat G-91 from 1959 and Aermacchi MB326 followed from 1979 by the MB339. Local license manufacturing of helicopters was done by Agusta. License built Fiat F-104G were manufactured from 1963 and later Aeritalia developed the Italian version F-104S that entered from 1969 service of which some 246 were delivered. In the seventies and eigthies Aeritalia developed the G222 transport and C-130 Hercules entered service. In European programs Italy joined the Tornado program with some 100 IDS/IDT and ECR delivered. 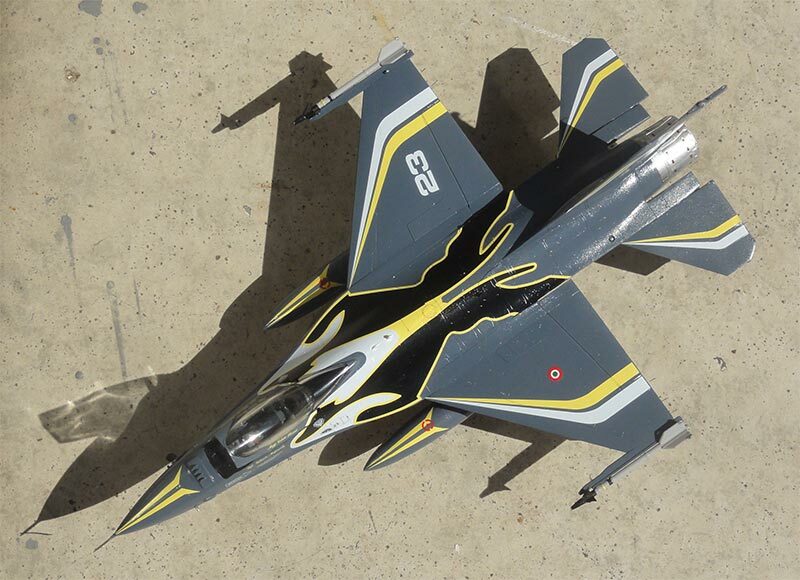 With EMBRAER a new AMX trainer was developed. In 1990 during the first Gulf War the AMI also participated with the Allied Forces. 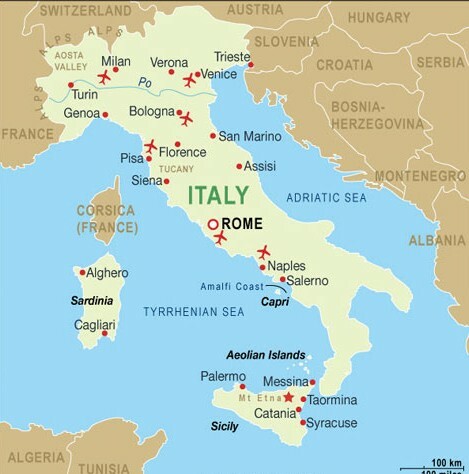 Other crises were in the Balkans and on Italian bases NATO coalition aircraft were also based. Also Italy was partner in the Eurofighter / Typhoon program with over 120 Typhoons being put into service. Due to substantial delays in the Eurofighter program, as a stop gap from 1993 Tornado F3's from the RAF were leased followed in 2003 by ex-USAF refurbished F-16 ADF fighters. Further fleet updates are for the Tornado IDS/IDT and new transport aircraft are put into service including C-130J, C-27J Spartan (a US version of the G222). Italy also is a partner in the new generation Lockheed Martin F-35 Lightning II with local license manufacturing with over 70 F-35 aircraft on order. Other current types are also various helicopters, such as Agusta-Westland AW101 and AW139. The Italian Naval Flying Service flies various types including some 24 NH90 and 32 AB-212 and AW101. Special is that still the naval combat aircraft AV-8B Harrier II is operated that are to be replaced by the F-35B. The Italian Army Aviation flies over 200 helicopters suh as CH-47 Chinooks, NH90 TTH and various Agusta-Bells including A-129. F-16A ADF Block 15 , AMI 5th Stormo/ 23 Gruppo, Italian Air Force in 2008.